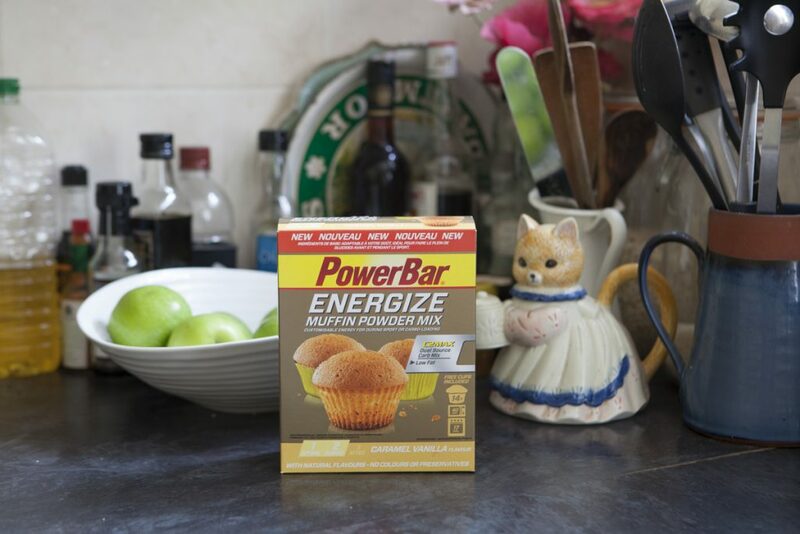 PowerBar, one of the original manufacturers of on-the-go sports nutrition just celebrated their 30th birthday by releasing a new PowerBar ENERGIZE Muffin Mix along with a revamped ENERGIZE bar made with natural ingredients. I love getting sports nutrition products through the post – I nibble and slurp my way through quite a lot of different stuff as I like the ease of just grabbing a bar, some gels or a shake when I need one. I eat plenty of ‘real’ meals as well but as I train a lot, I find these kinds of products really handy. I’ve tried loads of different stuff and I know which I like best (that’s a future post) but I do enjoy trying something new. So the Muffin Mix is indeed something new and seems to follow a mini trend I’ve noticed for kind-of-but-not-really DIY sports nutrition. I’m not totally sure where this has come from – maybe people like to feel something is more natural if they make it themselves, but they haven’t the time or inclination to shop for a bunch of different ingredients and bake up something from scratch? Personally, I have no problem with ready-made sports nutrition. I like a lot of it. PowerBar have come up with quite a few new things recently – I haven’t tried the Performance Smoothies yet but I want to – and to my mind, the reason they’re offering these is because people who eat a lot of sports nutrition products get a bit bored of eating the same old thing all the time. The muffins are designed to be consumed before or during exercise. As I don’t consume sports nutrition products before cycling, only during, that means I’d have to carry a cupcake in my jersey pocket which isn’t really practical. Because of that, I chose to make them to consume before a tough evening ride (the local chain gang) before which I would generally have a snack, just not a sports specific one. Each box contains three sachets of mix with making between 4-6 muffins (according to the pack). It’s all very straight forward; you simply tear open a sachet, mix with 80ml of water et voila, muffin mix. 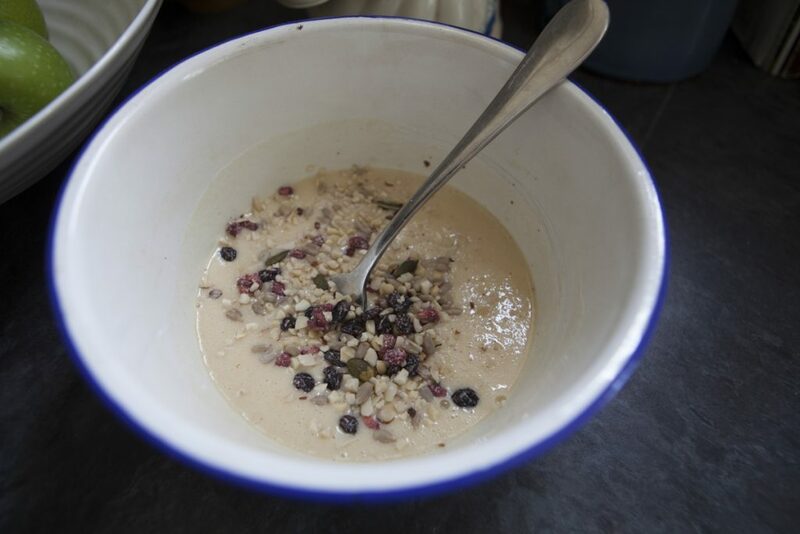 I added some chopped nuts and dried fruit at this stage to cram in as much nutrition as I could, but you can just bake the muffins as they are. After mixing everything together, you divide the mixture between the paper cases provided in the box. 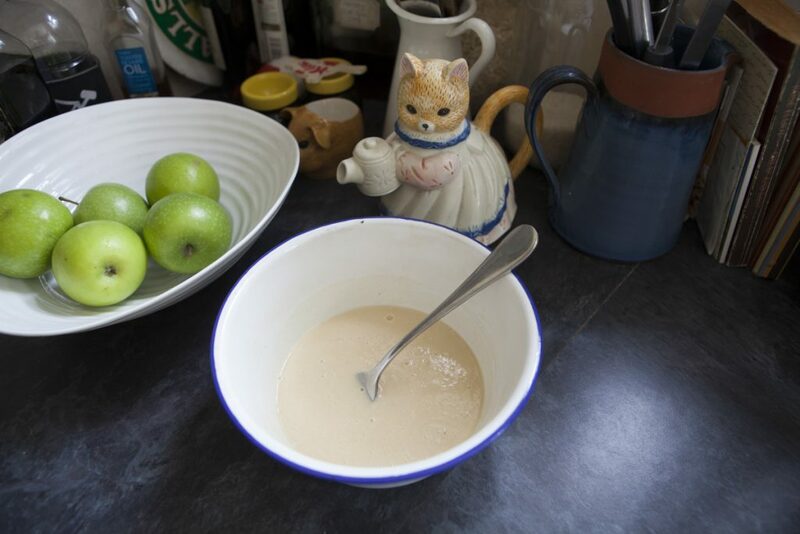 Its quite runny so I reckon it would have been easier to put mix everything in the measuring jug then you just pour the batter into the cases. The runniness made my cases lose their shape a bit – maybe because they were standing around for a while whilst I took photos. I bunged them in the oven (it takes 40seconds in a microwave but we don’t have one) and seventeen minutes later, we had muffins. The taste really, really nice and it was hard not to just eat all of them. In the end, we nearly did – we had two each, but hey, they’re small. 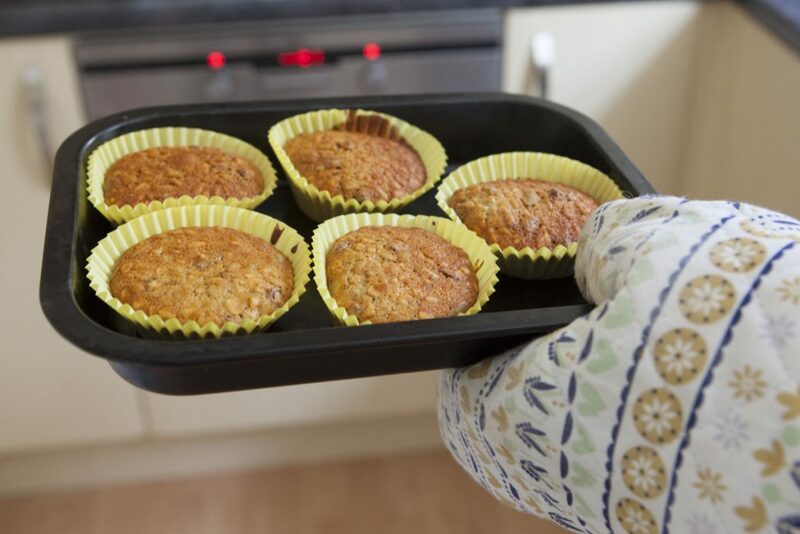 Without the nuts they’re approximately 100 calories each, and they’re lower in fat and dietary fibre than regular muffins so that you can digest them more easily whilst (or before) riding. 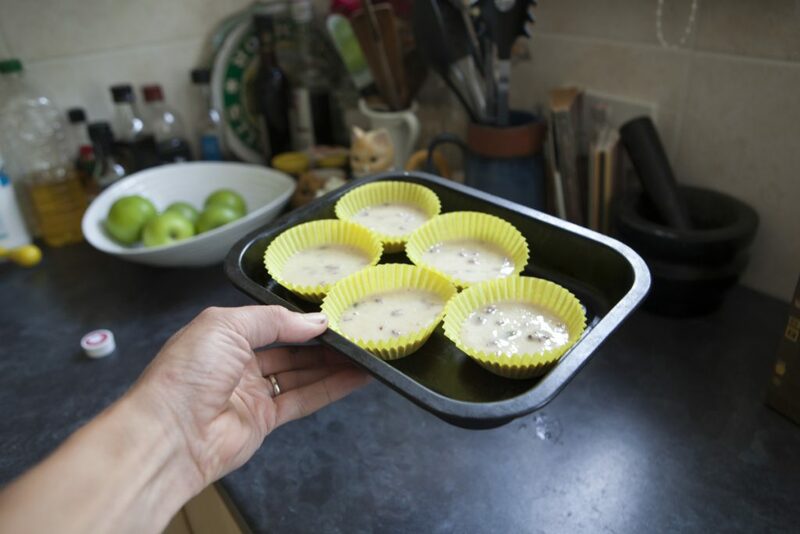 The main downside to these yummy little cakes is that the box of mixture costs £9 and makes between 12 and 15 muffins, which is a bit on the expensive side. I suppose if you’re comparing the cost per unit to an energy bar then it’s not as bad, but I’m comparing it to the cost of cake, and £9 would buy an awful lot of really nice cake. I’m off to chain gang now to see if they have made me faster! I’m finding this whole do-it-yourself nutrition thing a bit odd as well. It seems, like you say, the nutrition industry is trying to make a new market from the slightly more “natural” element to these products. So doesn’t it stand to reason that “natural”, rather than developed sports products, might have the edge? Like the banana, the nuts & seeds or the rice etc. that the human digestive system has spent thousand of years adapting to, surely must be easier to use, as well as more efficient compared, to the Gels or Energy Bars I have on my desk now? I know a few friends who are training for certain non-cycling events and who have done some general reading around the subject of specific diets, especially around processed/refined/easily digested sugars, and they follow the whole natural approach, and swear by it in a (sometimes) over zealous way. Just wondered if anyone has other thoughts or maybe examples of natural sports nutrition thats easy to incorporate, doesn’t cost the world and doesn’t mean you have to spend your whole life looking for all the ingredients and components?